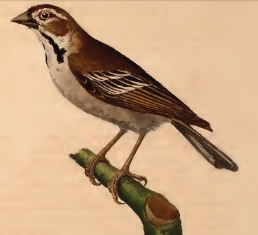 The Chestnut-crowned Sparrow-Weaver Plocepasser superciliosus is found in the savanna belt from Senegal across to Eritrea and central Ethiopia and as far south as Kenya. The adult (painting right) is a brown and white sparrow-like bird, with a distinctive head pattern: rufous crown, white supercilium and subocular mark, rufous patch on cheeks and ear-coverts separated by white line from prominent black malar stripe. It has white wing-bars and wing feather edgings. The immature bird is duller and paler than the adult. This species was collected by Eduard Rüppell, a German naturalist and explorer, in Kordofan (Sudan) in 1825. He sent his specimens to Philipp Jakob Cretzschmar, a German physician and zoologist, who described around thirty new species in "Atlas zu der Reise im nordlichen Afrika von E. Rüppell", 1826-30 ("Atlas of Rüppell's Travels in Northern Africa"), including this species. The description was accompanied by a colour painting (right). No subspecies of the Chestnut-crowned Sparrow-Weaver are recognised (see map right, based on Birds of Africa). The Chestnut-crowned Sparrow-Weaver is found in woodland and tall bush areas. In Nigeria it inhabits mature woodland, but appears to be more common in degraded and overgrazed erosion areas with many thorn bushes. It feeds on seeds by foraging on the ground, in tall grass heads, and in canopies of large bushes and small trees. It occurs mainly in pairs and can be unobtrusive; sometimes it is found in small flocks and sometimes feeds on the ground in loose flocks with other seed-eaters. There is one record of predation - a python swallowed an adult Sparrow-Weaver in Sudan. The Chestnut-crowned Sparrow-Weaver is colonial, with several nests in a single tree. It may be a co-operative breeder. The nest (photo left from phown 695) resembles that of the White-browed Sparrow-Weaver. Nests are placed on branches rather than slung between them, up to 6 m above the ground. At least ten weaver species,including the Chestnut-crowned Sparrow-weaver, have been recorded as nesting near wasps. Little is known about its breeding. The eggs (clutch size is 2) are cream or red, and heavily spotted with grey and lilac. Laying dates are known, but no more. There are 3 PHOWN records (see PHOWN summary); two records from Gambia had one nest each and a record from Ethiopia had 8 nests. Many more PHOWN records are needed for this uncommon species to obtain more information on its breeding. Submit any weaver nest records to PHOWN (PHOtos of Weaver Nests) via the Virtual Museum upload site.